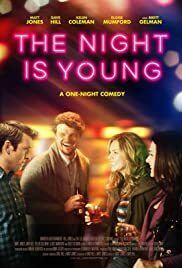 Director: Dave Hill, Matt JonesWriters: Dave HillStars: Matt Jones, Dave Hill, Kelen ColemanSummary: This is the story of the night Matt and Dave met Amy and Syd. All feeling a bit fed up with their jobs and Los Angeles, luck would have it that they decide to go to the same bar on the same night. Thankful to meet anyone who isn't painfully self absorbed, the drinks pile up as the four twenty-somethings find unexpected friendships, and maybe something more.